IOP Hosts Discussion on Foreign Policy Challenges Facing U.S. 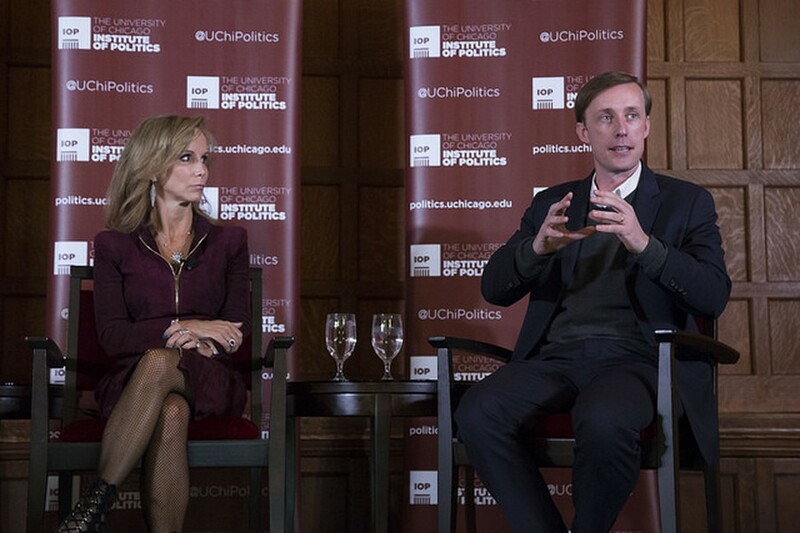 The Institute of Politics (IOP) hosted Jake Sullivan and Frances Townsend in the Quadrangle Club on Friday for a conversation about the foreign policy challenges currently facing the United States. Drawing on years of national security experience under different administrations, Sullivan and Townsend discussed President Donald Trump’s recent trip to Asia, the Iran nuclear deal, American and Russian relations, and how approaches to these issues have changed in recent years. The discussion was moderated by the IOP’s former executive director, Steve Edwards—who is now vice president and chief content officer at WBEZ, Chicago’s public radio station. Sullivan joined Hillary Clinton’s 2016 presidential campaign as a senior policy adviser after working as national security adviser to former vice-president Biden and as director of policy planning at the Department of State. He is currently a senior adviser to the U.S. government for the Iran nuclear negotiations, as well as a visiting professor at Yale Law School. Townsend served as homeland security adviser to former President George W. Bush from 2004­–2007, having held multiple positions in the Department of Justice under three administrations. She previously served as deputy assistant to Bush and as deputy national security adviser for combating terrorism. She is currently president of the Counter Extremism Project. The night began with Townsend questioning the President’s recent Asia tour, claiming that the trip’s productivity “remains to be seen.” Townsend pointed out how the trip underscored the disconnect between the administration’s language and its actual operations. “[Trump’s] rhetoric will be quite inflammatory, quite concerning, and then what he actually does—what appear to be the actual policies of the administration—appear more traditional,” she said. Sullivan agreed, stating that the larger challenge exposed by the trip was the rise of China. He said China’s development is the most pressing strategic question for the presidency and future leadership in Asia, going beyond the immediate crisis of North Korea and the challenges the U.S. is facing in the Middle East. The panelists also discussed the Iran nuclear deal. “You can’t have your hand both on the ballot box and on the Armalite—a gun—at the same time,” Townsend said. In her view, the Iranian deal essentially permitted Iran to have their hands in both. Townsend went on to say that the Iranians do not deserve any of the credibility they got from the deal, and from American officials, like Sullivan. Although the nuclear deal was drafted knowing the cataclysmic situation in Syria, the deal’s mission was only to negotiate just one particular challenge, according to Mr. Sullivan. “I’m very glad that we are not facing this Iranian challenge right now, given what we are up against in North Korea,” Sullivan said. When discussing North Korea, both speakers cautioned that Trump’s dealing with North Korea is a dangerous situation. Sullivan suggested that the idea that North Korea is not looking to simply obtain nuclear power, but also to use it to gain control of the entire Korean peninsula, has been floating among senior officials in the administration. “[The popularization of this rhetoric] means the inertia and build up towards the possibility of the U.S. taking military action in North Korea is accelerating, and I think the percentage chance of that happening is 2018 is real,” he said. She thinks the President’s tweets and flippant statements have introduced an element of unpredictability in American foreign policy. Sullivan delivered the event’s final thoughts. “One thing that I have believed as a kid, and have always believed, is that the U.S. can be, at its best, a force of good in the world,” he said.